Dell Tarzan #39 through #53 shown above. Tarzan is a TM Trademark of Edgar Rice Burroughs Inc.
Tarzan of the Apes is the creation that writer Edgar Rice Burroughs is best known for. But the apeman wasn't his first creation. And for many fans, Tarzan isn't even their favorite Burroughs character. Whereas Tarzan can be described as a Romance of the Jungle, Burroughs' first novel was a Romance of the Planets. Under the Moons of Mars was first published in 1912 by All Story Magazine under a pseudonym, and reprinted five years later in hardcover by A.C. McClurg with the title of A Princess of Mars (shown right). Here Burroughs introduced John Carter of Mars, a Civil War veteran and the greatest swordsman on two worlds. Like Tarzan, A Princess of Mars ended with a cliffhanger where John Carter, after having just saved the planet and his love, Princess Dejah Thoris, is suddenly transported back to Earth by the same mysterious means that he came to Mars. John Carter would return to Mars in The Gods of Mars, and his quest to win the hand of Princess Dejah Thoris would be resolved in the third book of the opening trilogy; Warlord of Mars. There would be a total of 11 published volumes (the complete First Edition collection is shown above), all filled with high adventure in the surreal landscape of a Mars very different from that we know today. Most modern readers assume that John Carter had traveled not just through space, but to a different reality as well. Burroughs' Mars is a lost world where ancient and crumbling cities housed a variety of races and monsters, filled with women who wore virtually no clothing -- only jewelry. The beauty and savagery of the world are shown in the covers for the brief series of paperbacks done by Roy G. Krenkel for Ace (shown right), before the dispute over rights was settled in the Sixites. The Ballantine First Edition set was covered by Robert Abbett, who incorporated the unique flying ships of Mars into many of his paintings, as shown in his second different cover for Thuvia, Maid of Mars (shown left). 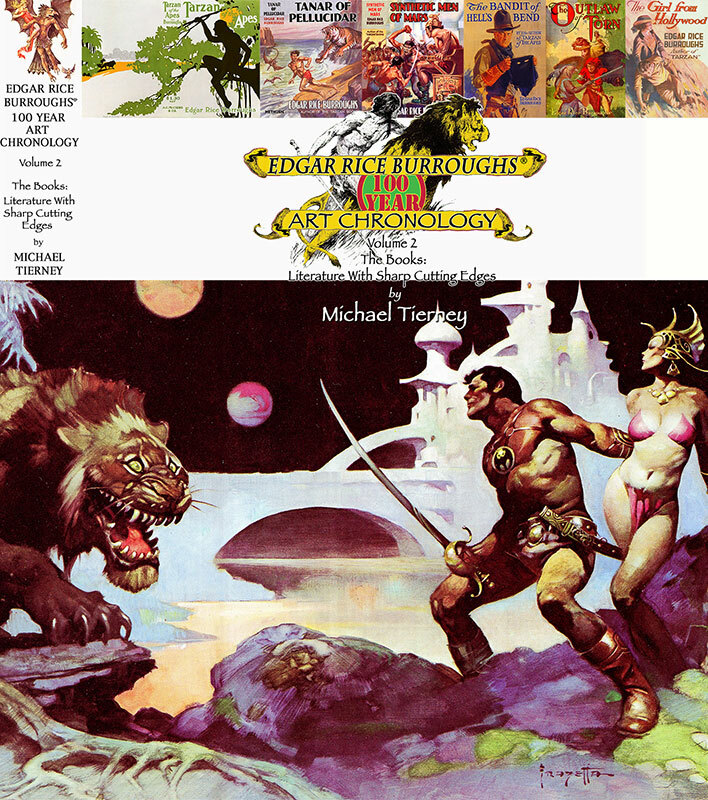 Abbett would first be replaced by a set featuring the wraparound artwork of Gino D'Achilie, who was in turn replaced by another set of wraparound covers by fantasy painter Michael Whelan (shown left). The cover at the top by Frank Frazetta, from the Science Fiction Book Club set (shown right), sums up the characters better than any other illustration. Here John Carter faces a monstrous threat armed only with his sword, all while Dejah Thoris watches confidently. 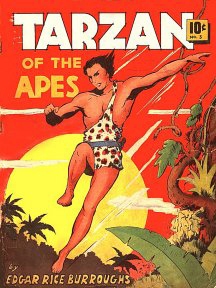 And, just like Tarzan, all of Edgar Rice Burroughs' creations were unshakably moral. John Carter of Mars was no exception. This is one reason why so many modern writers have failed when trying to adapt or expand on Burroughs' creations. They simply do not fit into the modern concept of dysfunctional anti-heroes. John Carter would lay down his life to protect his Princess. Likewise, Dejah Thoris would commit suicide before committing adultery. The novels are filled with scenes where Dejah poises a knife over her breast, just as John Carter makes a timely rescue. Unlike Tarzan, John Carter did not have great success in other media. Only recently has he started to be transferred to the screen, first with a low budget film, and soon with one of more stature. But John Carter did beat Tarzan to the comic books with new material, starting in 1939 with an adaptation of A Princess of Mars in The Funnies #30. 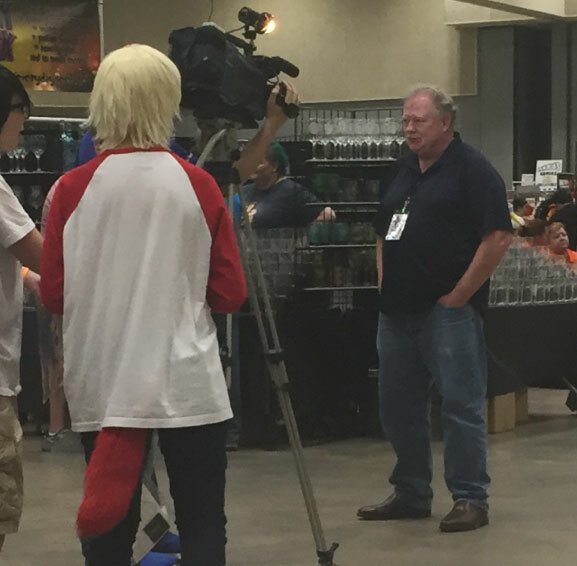 The first four issues were drawn by Jim Gary. With issue #34, Edgar Rice Burroughs' son, John Coleman Burroughs, took over and would draw every issue until the series ended in issue #56. John Coleman Burroughs would also contribute the John Carter covers for Funnies issues #35, #36, #37, and #40, along with an inset clip on #42 (all shown above). The stories from these Funnies would later be collected into the John Carter of Mars Big Little Books, and predated the John Carter newspaper strips, for which John Coleman Burroughs continued to do the art (image shown left courtesy of the Jim Albert collection). The entire newspaper run is available to read at the Erbzine website. John Coleman Burroughs also illustrated ERB's third longest running series of novels, David Innes of Pellucidar, in the scarce 1940 Hi-Spot #2 (shown right). This comic was obviously intended to continue, but never did. Issues #1 and #3 on were titled Red Ryder. The Warlord of Mars was back in comics during the early Fifties, when Dell ran a short series with art by Jessie Marsh in Four Color #375, #437, and #488. The trio were reprinted as a John Carter mini-series by Gold Key in 1964 (both shown left). When DC Comics took over Tarzan in 1972, they also started running John Carter tales in the short-lived Weird Worlds of Edgar Rice Burroughs (shown right), which also featured other ERB creations. But the series only lasted a couple of years. In 1977, Marvel brought John Carter back to the comics. 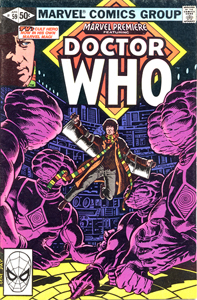 At first, the comics were very faithful to the original concepts, featuring dynamic artwork by Gil Kane (#1 shown left). Issue #18 featured Frank Miller's (Sin City, 300) first work for Marvel. But as writers continued to change, the modern direction of making the characters dysfunctional also crept into the stories. Then came the story where John Carter and Dejah Thoris were held prisoner in an underground city. To stop their captors from beating John Carter, Dejah Thoris agreed to sleep with their leader. A stereo needle ripping across a record could not describe better how off track those characterizations were. This was not the unconquerable hero and noble heroine, who would commit suicide before adultery. I stopped reading at that point, and apparently wasn't the only one. The series was soon canceled and John Carter of Mars disappeared from comic shelves for a long time. Now, a high budget movie is in the works and a new Warlord of Mars from Dynamite Comics is about to debut. It doesn't appear to be licensed, since Edgar Rice Burroughs' trademarked name appears nowhere on the advertising. But, putting all matters of public domain rights to the side, at the very least the upcoming series (Diamond Comics catalog ads shown right and left) looks like it will have some pretty nice covers. John Carter of Mars, a favorite of many fans of Edgar Rice Burroughs, still battles on. *You can read my review of Dynamite's Warlord of Mars #1 in issue #1675, March 2011, of Comics Buyer's Guide magazine. If you enjoy the high adventure of John Carter of Mars, and stories that include travel to exotic locations, then you'll probably enjoy the Wild Stars! This creation of Robert E. Howard was equally adept in combat with both a knife and a sword, and about any other kind of bladed weapon ever made. Up next: Conan the Barbarian!